Next week marks the 100th anniversary of the start of World War I. It was the great disaster of the 20th century, the one that summoned or forced the disasters that would follow, from Lenin and Hitler to World War II and the Cold War. It is still, a century later, almost impossible to believe that one event, even a war, could cause such destruction, such an ending of worlds. Thrones were toppled, empires undone. Western Europe lost a generation of its most educated and patriotic, its future leaders from all classes—aristocrats and tradesmen, teachers, carpenters and poets. No nation can lose a generation of such men without effect. Their loss left Europe, among other things, dumber. Reading World War I histories, I have been startled to realize the extent to which the leaders or putative leaders of the belligerent nations personally suffered. A number of them fell apart, staggering under the pressure, as if at some point in the day-to-day they realized the true size and implications of the endeavor in which they were immersed. They seemed to come to understand, after the early hurrahs, that they were involved in the central catastrophe of the 20th century, and it was too big, too consequential, too history-making to be borne. Some would spend the years after the war insisting, sometimes at odd moments, that it wasn’t their fault. 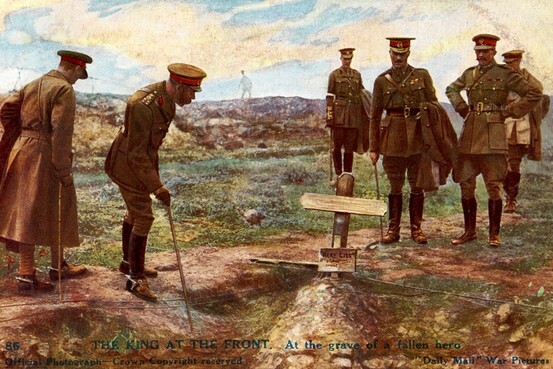 Illustration of King George V visiting a soldier’s grave on the Western Front during World War 1. As Miranda Carter shows in “George, Nicholas and Wilhelm” (2010), the king of England, the czar of Russia and the kaiser of Germany were all in different ways wrecked by the war. Barbara Tuchman, in the classic “The Guns of August” (1962), notes how in the early days of the war Wilhelm’s margin notes on telegrams became “more agitated.” (“Rot!” “He lies!” “False dog!”) In time, top brass shunted him aside and viewed him as irrelevant. The kaiser rarely referred to the sufferings of his people. Ms. Carter writes: “Wilhelm had always had difficulty in empathizing with others’ difficulties.” When his country collapsed, he fled to Holland, where in conversation he referred to his countrymen as “pigs” and insisted that the war was the fault of others. He died at age 81 in 1941, two years into World War II. King George V did have empathy, and it almost killed him. Touring the Western Front, he suffered at the sights—once-rich fields now charred craters, villages blasted away, piles of dead bodies. He aged overnight, his beard turning almost white. Ms. Carter writes that he now surveyed the world with a “dogged, melancholic, unsmiling stare.” A year into the war, a horse he was riding on a visit to the front got frightened, reared, and fell on him. The king never fully recovered from the injuries. Years later, he was haunted by what he called “that horrible and unnecessary war.” In 1935, war clouds gathering once again, he met up with his wartime prime minister. The king, wrote Lloyd George, “broke out vehemently, ‘And I will not have another war, I will not.’ ” He also said that the Great War had not been his fault. He died the following year. Two years in, Kokovtsov thought Nicholas on the verge of nervous breakdown. So did the French ambassador, who wrote in the summer of 1916: “Despondency, apathy and resignation can be seen in his actions, appearance, attitudes and all the manifestations of the inner man.” The czar wore a constant, vacant smile, but glanced about nervously. Friendly warnings that the war was not being won and revolution could follow were ignored. For him, in Ms. Carter’s words, “Contradiction now constituted betrayal.” At the end, those close to Nicholas wondered if he failed to move to save his throne because he preferred a crisis that might force his abdication—and the lifting of burdens he now crushingly understood he could not sustain. He may have. Weeks earlier, weak and feverish, he had physically collapsed. It was a flu, a cold, possibly encephalitis. He rallied and returned to work but sometimes appeared impatient, euphoric or energized to the point of manic. Mr. Berg : “Wilson’s bizarre comments did not end there. He described the Council of Four meetings, how each delegation walked like schoolchildren each day to its respective corners. Now, with the furniture regrouped, he said each country would sit according to color”—the reds in the American corner, the greens in the British. Grayson didn’t know what to think. Perhaps it was nervous exhaustion, perhaps a sign of something more serious. After returning to the U.S., Wilson launched a grueling campaign for America to join the League of Nations. That fall, in the White House, he would suffer the stroke or strokes that would leave him disabled the rest of his life. So what are we saying? Nothing beyond what I suppose has long been a theme, which may be a nice word for preoccupation, in this space: History is human. And sometimes it turns bigger than humans can bear.